Intel’s new fourth-generation Core family processors—code-named Haswell and officially launched Saturday—are more than just power-efficient speed demons. They also give the world’s biggest name in microprocessors an opportunity to update its Ultrabook specs: Expect even thinner designs, direct Windows 8 gesture support, and longer battery life as Haswell laptops roll out. Intel formulated the Ultrabook concept in late 2011 when it became clear that ARM-powered tablets were stealing market share from conventional notebook PCs. The specification of what qualifies as an Ultrabook is updated each time Intel ships a new mobile platform. The original definition was relatively vague, but Intel is beginning to button things down with Haswell. Ultrabook battery-life requirements have been extended to provide at least six hours of HD video playback. An Ultrabook must now be outfitted with a touchscreen, and Intel is encouraging manufacturers to build two-in-one convertible designs (notebooks with touchscreens that detach from their keyboards to become tablets). Also, no laptop can be thicker than 23mm (0.9 inches) if it’s to be marketed as an Ultrabook, and it must now be hardware-ready for voice command and control. 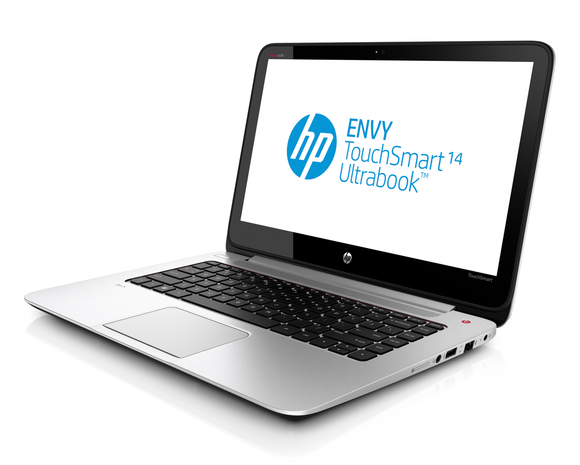 HP’s Envy TouchSmart 14, announced May 23 (and described only as having a “4th-generation Intel processor”) is one of the first computers we’ve seen that fits Intel’s new Ultrabook definition. Ultrabook battery-life requirements have been extended to provide at least six hours of HD video playback; a minimum of nine hours when Windows 8 is idling; and at least seven days of standby time. An Ultrabook must now wake from sleep mode in less than three seconds. In addition to supporting wireless networking, an Ultrabook must now also support Intel’s Wireless Display technology for streaming its video output to a supported display or adapter. Finally, all Ultrabooks will come with antivirus and antimalware software preinstalled and support Intel’s antitheft and identity protection technology (in case you were wondering why Intel dropped $7.6 billion to acquire McAfee back in 2010). It’s good to see Intel lifting the bar in its definition of the Ultrabook, but several of its new spec requirements just aren’t very challenging. Apple’s MacBook Air measures just 0.68 inches at its thickest point, for example, and also comes with advanced features such as Thunderbolt. Intel’s spec doesn’t even demand USB 3.0. And why isn’t there a minimum display resolution requirement, or at least an expectation that an Ultrabook will have either Intel’s best integrated GPU—the Intel Iris Pro Graphics 5200—or a discrete GPU? Click here to get the whole scoop on Intel’s mobile fourth-generation Core lineup.